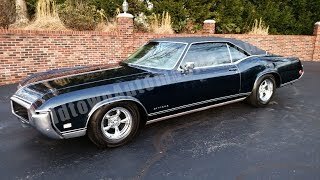 Hi, I am interested in your 1969 Buick Riviera (stock #1770) listed on Autotrader for $23,900. I'd like to get more information about this vehicle and confirm its availability. NICE unrestored car with one repaint, rust-free straight southern body and floors, 430/ 360 hp #s matching engine and turbo 400 automatic transmission, power steering, power brakes, chrome American Wheels, nice original interior with power seats, power windows, tilt wheel, am / fm stereo, air conditioning car runs out and drives great. Approximately 50 photos and a video of this car on our website at www.oldtownautomobile.com.